Pack Size 5g pouch packing size. Bulk Packing 1 kg, 5 kg Aluminium Foil Pouch Packing. Dose 5g/45 to 50 ltr water. Natural Brassinolide is a plant hormone. The first isolated brassinosteroid, it was discovered when it was shown that pollen from rapeseed (Brassica napus) could promote stem elongation and cell division.It offers protection against various crop diseases and increases the resistance of standing crops against different pest & insects. The product is manufactured using high-quality raw material procured from the most renowned vendors of the industry. It is available to our clients in various specifications as per their requirements. 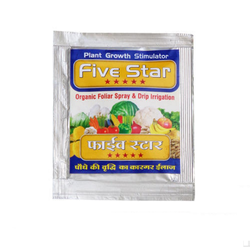 Growth promoting and for amazing flowering and Fruits in all crops. 5g/45 to 50 ltr water. 1 kg, 5 kg Aluminium Foil Pouch Packing.